Emily’s List, Where Is The Support For Nan Rich? Last night I had a wonderful interview with Nan Rich, former State Senator, and current candidate for Governor, for the state of Florida. You can listen to the interview Here. Who is Nan Rich, you might ask. Well, you wouldn’t be alone. A lot of Floridians, and the rest of the country for that matter, don’t know who this spectacular woman is. We need to change that. Read about Senantor Rich on her website. While former Governor Charlie Crist, who is also running for Governor of Florida, is a very well-known name, he isn’t the only candidate Democrats have to vote for. I’m very disappointed at the lack of support Senator Rich has gotten from the Florida Democrats AND the National Democrats. It’s as if they have completely brushed this very qualified, progressive, life-long Democrat aside. They have made Charlie Crist the heir-apparent to the nomination. So has Main-Stream Media. Yes, Charlie Crist is well known, but Nan Rich would also be well-known if she had support from the party that she has dedicated her entire life to. Isn’t Emily’s List’s mission to get progressive WOMEN elected? What happened here? Why isn’t Nan Rich even listed? Charlie Crist is very shrewd. He has refused to debate Nan Rich on the issues. Is it because a light would shine on his changing positions? I don’t think so. I think the real reason Charlie Crist won’t debate Nan Rich is because she would then have a platform for people who aren’t die-hard politicos to see who she is. That scares Charlie Crist more than his ever-changing positions and parties. Let me make it clear that I respect the work Emily’s list does, and has done. this decision, however, is baffling. I apparently am not the only person who has been trying to get answers about this blatant snub of Nan Rich by Emily’s list. Read this article that appeared in Sunshine State News. Emily’s List endorsed Nan Rich previously, so something other than her politics is keeping this PAC from helping her now. update: After contacting Emily’s list, I was told that they hadn’t yet endorsed Nan Rich, but were “keeping an eye” on the race. Really? What could possibly be the reason Emily’s List, who prides themselves on supporting progressive women candidates, hasn’t endorsed Nan Rich? It certainly can’t be because she is behind Charlie Crist in the polls, after all, while Emily’s List hasn’t “recommended” Heather Mizeur in Maryland, they added her to the “list” , allowing exposure and donations, and she trails Lt. Gov. Anthony Brown AND Attorney General Doug Gansler in the primary race for Governor. update2: after Alex Sink‘s loss, I contacted Emily’s List again. They quickly got Alex off the front page, but still no Nan. update3: Emily’s List remains tight-lipped about this Nan Rich snub, and has even become somewhat hostile to questions. The plot thickens. So I ask again, what is the REAL reason Emily’s List hasn’t “listed” Nan Rich. Yeah, right, blame the media. Don’t blame her for running a lackadaisical campaign. Emily’s list is great, and they are making the right non-endorsement in this situation. I guess it couldn’t POSSIBLY be because a couple of their major donors are pro-Charlie Crist. Emily’s List is supposed to be un-bossed and un-bought. Guess that isn’t the case. Excellent interview here with Candidate Nan Rich (Dem) who is running for Fla Governor. I have been hoping that someone would shine a light on this great woman. I discovered her for myself, accidently in Oct. of last yr. (2013). Nan Rich has been snubbed since not being allowed to speak at the Jefferson-Jackson fundraising dinner in mid 2013. To me she represents the type of person Florida needs as the next governor. I think Fla residents need someone who honestly cares about people, the environment, and many other tough issues facing Floridians. The other Candidate will not agree to have a debate with her. He is not even considering it, or something similar is what he responded to a reporter in an article I read. If this is not the most arrogant thing to say & feel, I don’t know what is. Is this his decision to make? I am speaking of Dem. candidate Charlie Crist. We do not deserve the opportunity to see 2 candidates in the same political party answer questions and discuss important issues? Is it NOT our place, as voters to choose who WE want to run in an election for the next governor of the state of Fla, against Incumbent Gov. Rick Scott (R)? I truly think Mr. Crist is afraid to debate Nan Rich because he knows he cannot beat her in a debate. A debate will show voters who to choose to run against Incumbent FL Governor Scott in the upcoming November election. There are many of us who are tremendously tired of the ongoing corruption and undeniable special treatment by some in political office, going back to when Republican Jeb Bush was governor of Florida. It has got to stop. Nan Rich is taking on the NRA (they gave her an “F” rating). She knows the “Stand Your Ground” law must be changed in FL. (Crist was (Rep) State attorney general of Fla when J. Bush (R) Gov. signed this into law in 2005, I believe it was). She will work towards getting this terrible law changed if elected. She is against “fracking” & other negative environmental aspects of oil company’s. She is Pro medical marijuana, pro women’s rights, will raise the minimum wage to $10.10 when elected and so much more. Please look at her web site & check for yourselves. Watch the interview here! Most importantly, she is Pro Florida & Pro Floridians. Florida has waited a long time for a candidate like her. We can NOT allow others to take this opportunity away from us. Especially, when there are some who support the super rich and the mega rich corporations. Thank You again, Ms. Wimes for this interview. I will share it with all I can & try my best to show other Floridians that Dem Nan Rich is already working hard for Floridians, working very hard to get her message out & hopefully everyone that is trying to silence her will stop. Charlie Crist who proclaims to be a Dem now, is trying to stop her, ignore her, or simply hopes she will go away. I am not alone. There are many sharing information about candidates trying to insure we elect the best person for the job. Someone who will stand up for us. It has been a long time in the state of Florida since we have had this and it has taken its toll in many ways. I will continue to stand up for Dem Nan Rich and spread the message to others that she is the person we need to vote for in the August primaries here in Florida & again in November when we vote for who we believe is the best person to be the next Governor of the state of Florida. Anyone reading this, please go to Dem Nan Rich website (mentioned in interview). Read about her and her stance on important issues. Educate yourself. If you agree, please share this information with everyone you know that is going to vote. Also, volunteer for candidates you want elected. We can change Florida into the great place it once was. We can make it better. We all have to help people like Ms. Rich who are trying to help us. It’s so simple, really. Please join me and others. Thank you for doing this interview, Ms. Wimes. I plan on sharing it with many. 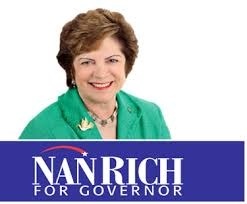 I have known Nan Rich for over 35 years, and she is focused on being the next Governor of Florida, she has served her community, State and Country well, working with HIPPY, a home instruction program for pre school parents and their kids, the Florida State Leg. as the Dem leader, PTSA and NCJW always prepared and she is what we need as a leader in Florida. Charlie Crist isn’t being arrogant by saying he won’t debate against Nan Rich, he’s making a calculated decision that doesn’t give her an expanded audience. Makes it seems like he’s the best option if he’s the only one. Nan Rich needs some help getting the word out. That’s is precisely my point! He doesn’t want the rest of Florida to know who she is! I would never give a dime to Emily’s list again. They have been bought out by the corporate political organizations. There exists an organization with the integrity and experience to recognize a true leader, that is Florida National Organization for Women. The first organization to endorse Senator Nan Rich.